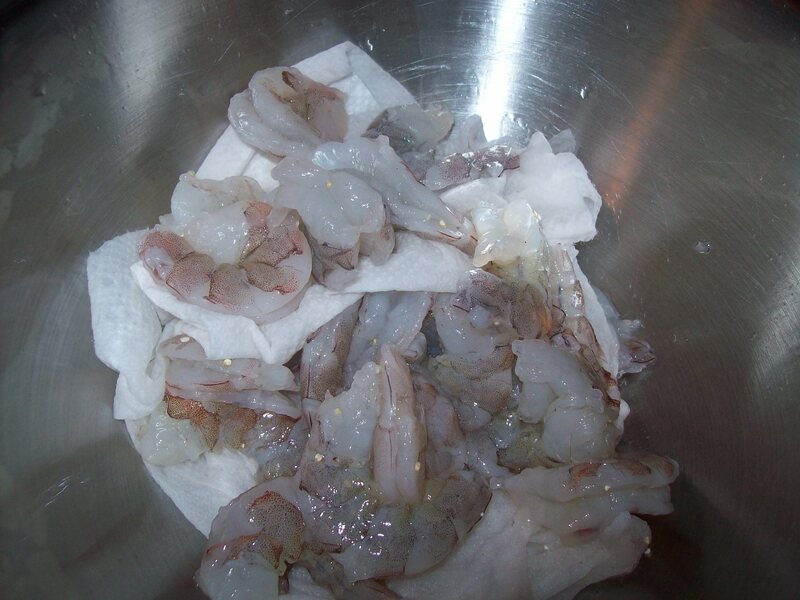 5:27 p.m.: A paper towel pad is a good way to quickly drain moisture from shrimp. Often, when we do lettuce wraps, I tend towards Asian flavors; but tonight I wanted something different. I grabbed paprika, chili flakes, and saffron from the spice rack and got to work with the shrimp. Really, it’s so simple to pull this together that it’s almost embarrassing: Just heat up some olive oil in a skillet, add a few cloves of chopped garlic (or, in our case, MANY cloves of chopped garlic, because we are either scared of vampires or really into garlic in our food), and throw the shrimp into the mix. They only need to cook for a few minutes, until they’re pink; as they’re getting their blush on, add 1/4 tsp. 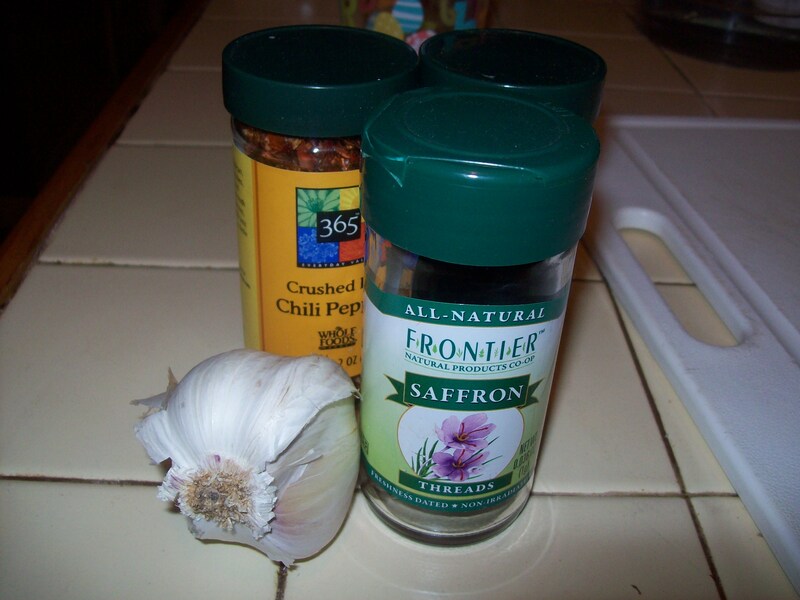 of chili flakes, 1 1/2 tsp. of paprika, and 1/2 tsp. of crumbled saffron threads to the pan. You’ll also want to season generously with salt and pepper. 5:35 p.m.: A veggie tale. 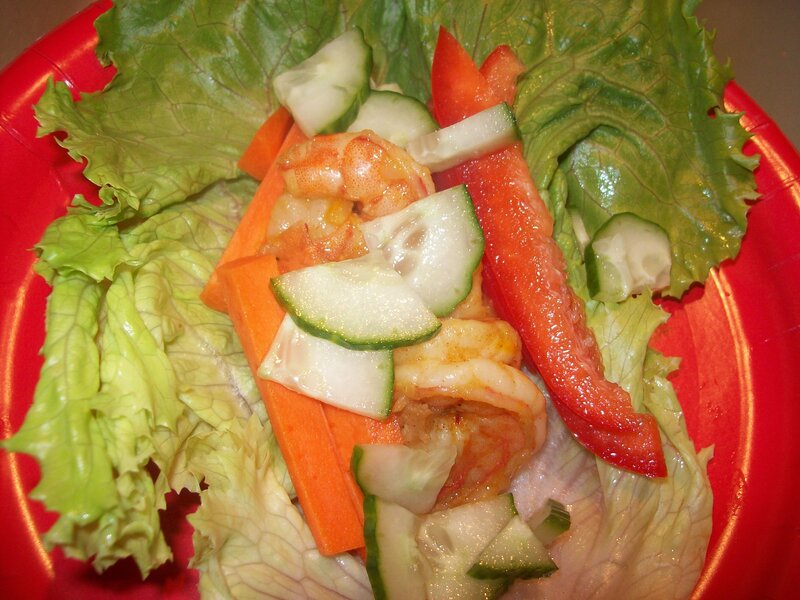 While the shrimp are taking their brief turn in the pan, you’ll have just enough time to dismantle some vegetables. There’s no need to cook anything. 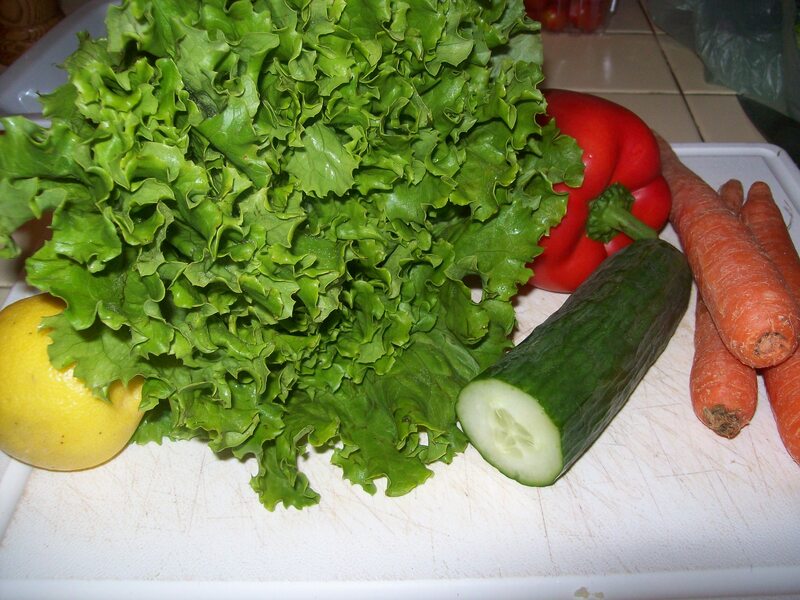 Peel the leaves off a head of butter or bibb lettuce, leaving them as intact as possible for wrapping purposes. Cut a bell pepper or two into matchsticks, then do the same to a few carrots (you could also grate the carrots, if you’re not great with a knife). Slice, dice, or otherwise make a cucumber into little pieces — we use English cucumbers because not only are the skins nice and edible, but there are very few seeds in them, so they’re easier to deal with and more pleasant to eat. 5:40 p.m.: That wasn’t so hard, was it? Throw all the vegetables onto a plate. I mean, arrange them neatly on an attractive platter. Yeah. That’s better. By this point in time, the quinoa that’s been quietly and secretly cooking in the background of all this lettuce-wrap business should be just about done. I usually go ahead and cook mine with a little olive oil, garlic, and homemade chicken stock, so it’s already flavored when I spoon it out of the pan and into a serving bowl. Less work for me, more yum for the family. Ready for the final tasks in this oh-so-challenging meal? Grate a little lemon zest — don’t bother measuring, just use about half of the lemon — into the shrimp pan. Squeeze that same half of the lemon over the top. Get the shrimp into a serving bowl or onto a plate. Take everything to the table. Place the back of your hand to your forehead and let everyone make sympathetic noises about how hard you worked to cook a healthy, from-scratch dinner for them. 5:50 p.m.: Just over 20 minutes after we began, there are lettuce wraps on our plates. Not too shabby. Then fill your lettuce leaves with a whole bunch of stuff, wrap it all up like a taco, and bite in. J. and I happen to like these with just a dash of hot sauce, and if we’d had an avocado in the house, you can bet it would have gone on top. But you can fill YOUR lettuce wraps any way you’d like to. I’ll never know. This entry was posted in Accountability, Cooking, Feeding kids, Meal planning, Parenting and tagged cooking, family, feeding kids, food, fridge to fork, Household organization, kids' health, meal planning, recipes, veggies. Bookmark the permalink. I also think your version would be good with the sweetness of OnceAMonthMom’s Sweet and Spicy Garlic Chili Sauce here: http://onceamonthmom.com/sweet-and-spicy-garlic-chili-sauce/ and some alfalfa sprouts. Can’t wait to try this! Wow, Robin, those sound so good! 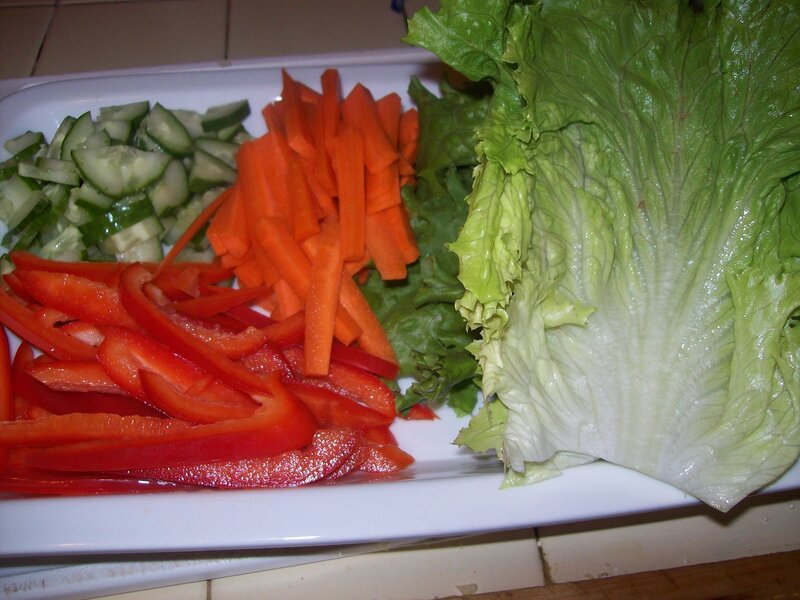 Yes, these lettuce wraps would taste excellent with a little hot sauce of any kind. I actually did put some on mine the day after when I ate the leftovers. Looks yummy! 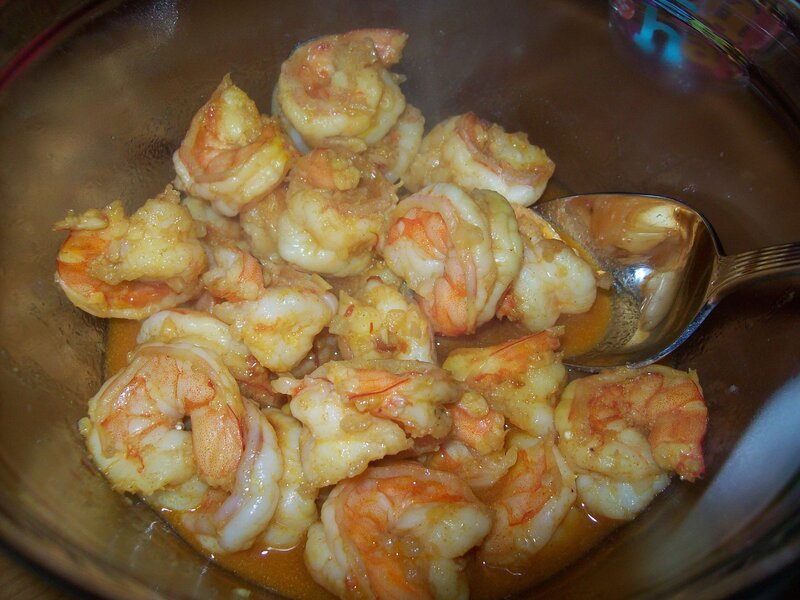 I always like my shrimp with a bit of something sweet – mango for the nieces, some orange for me. (Not a fan of mango.) Purslane would go nicely in this meal as well, I should think, if you had any. You’re right that purslane would be nice! And I LOVE mangoes or some other sweetness with shrimp. Great idea for next time!